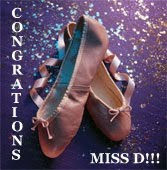 My wonderful friend over at Woman in the Midst:Raw has most kindly awarded a special something to Miss D for her ballet concert this weekend. What a beautiful, caring thing to do and Miss D was so surprised and happy. Thank you my friend for being so kind. That was really sweet of her!